While traditional rings are a lovely and popular choice, you don't have to stick with plain metal bands or even diamond bands when you get married. You don't even have to select a ring intended for bridal wear. Choose a style that is as unique as your relationship. Whether you are looking for a truly one-of-a-kind ring created just for you, or if you are more interesting in choosing wedding bands that aren't representative of traditional expectations, there are plenty of options to consider. While people typically associate custom ring design with engagement rings, it's also possible to commission custom wedding bands designed just for you by artisan jewelers and craftsmen. Brilliant Earth: This San Francisco-based jeweler's custom design process does not require visiting the showroom. Start the process by submitting a quote request via the company's website. Brilliant Earth's designers will use your ideas and sketches to create a one-of-a-kind design for you to approve. When the design has been finalized and your order has been placed, you'll receive a 3-D computer generated design or wax model for final approval. Bernadine Fine Art Jewelry: This custom jeweler sells gemstone and gold pieces based only on the artist's custom designs. Visit the site to select a gemstone and commission a one-of-a-kind piece designed just for you. Creative Metalsmiths: This North Carolina-based gallery specializes in artist-created one-of-a-kind and very limited edition jewelry designs.You can view pieces that have already been crafted at the Chapel Hill, NC gallery or contact the store to request a one-of-a-kind ring created by an artisan who works with the shop. Brent & Jess Fingerprint Rings: Commission a custom band that has the real texture of your fingerprint (or your spouses) embedded in the metal. Rings are available in gold, platinum and palladium. Birthstone family ring: A birthstone family ring is a unique idea for couples who have children from previous relationships before getting married. Including birthstones for the husband, wife and each child in the wedding ring can be a lovely symbol of the two families blending together. Signet rings: Depending on the couple's ancestry, signet rings featuring a family crest or coat of arms may be a unique choice. Monogram signet rings can be created with the couple's initials or other lettering that is particularly meaningful to them. Jade rings: Jade is believed to attract love and prosperity while offering protection, so it is a great symbolic choice for a unique wedding ring. 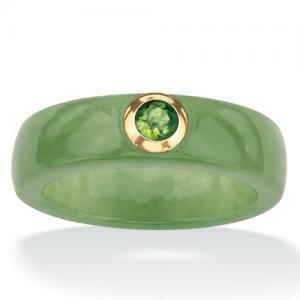 There are jade ring styles suitable for women and men. Artisan-crafted rings: The Sundance catalog has an extensive selection of many styles of rings hand-crafted by artisans. Choosing a ring set with gemstones other than white diamonds opens up the opportunity for some very interesting styles, whether you are purchasing ready-made styles or having custom rings created. When picking a gemstone setting for every day wear it is useful to choose a setting that is flush to the ring. This will stop the gemstone from catching on clothes or other objects. Danforth Diamond: Danforth Diamond carries a nice selection of gemstone rings that can be used as bridal jewelry. Options include styles with channel set stones and stones set in a diagonal pattern, as well as a few that feature uniquely shaped bands. Gemvara: Known for carrying an extensive selection of precious and semi-precious stones, Gemvara rings featuring amethyst, topaz, garnet and more that you can choose to use as wedding bands. Not all wedding rings have to be flat or adorned with only diamonds or other gemstones. Consider a band that features hand-carved or engraved designs reflecting your unique tastes. Green Lake Jewelry: This jeweler carries an extensive selection of hand-engraved wedding bands for women and men in gold, platinum and palladium. Some Green Lake Jewelry styles are metal-only while others feature diamonds and gemstones. Jewelry Vortex: This jeweler carries both engraved and carved bands in a wide variety of styles and metals for men and women. 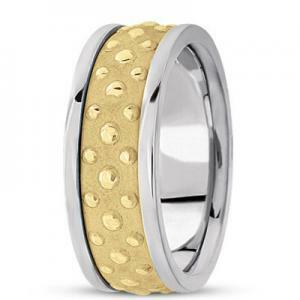 In addition to gold, platinum and palladium, Jewelry Vortex also carries titanium and tungsten bands. Choosing wedding bands that features two or more metal finishes or that are made with more than one type of metal can be a great way to incorporate unique style into your bridal jeweler. 25Karats.com: This online jeweler has a selection of hand-made two tone rings in a number of styles, including Celtic, braided and engraved styles in both smooth and rough finishes. 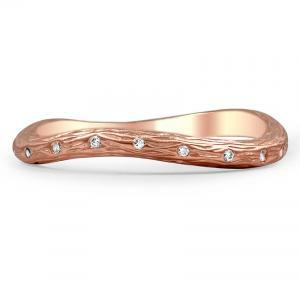 James Binnion Metal Arts: Specializing in moku gane rings, this jeweler is an excellent option for couples seeking bands that combine different metals to form beautiful multi-tone designs resembling patterns found in wood grain. 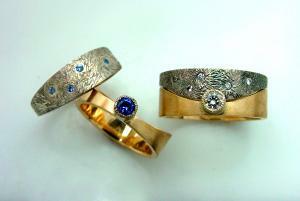 Todd Allen Designs: This jeweler offers a selection of beautiful twisted strand ring designs. Each design offers between five and eight strands of gold featuring a combination of white, yellow and rose gold. One of the most unusual options of all is to forego jewelry for a tattoo. Ink is a unique alternative to traditional wedding jewelry that is becoming increasingly popular. According to a Daily Mail article, couples are opting for inked-on ring selections ranging from simple band designs to tats featuring the names of their loved ones, the date of their wedding and meaningful symbols or branding marks. Remember that tattoos on hands fade more quickly than tattoos in other areas, so you should pick a simple style that will still look great even if the tattoo fades slightly. OffbeatBride: This site features images of a number of tattoo options, including bands, artistic and branding symbols, wedding dates, and more. CreativeFan: Visit this site to see images of 25 different types of tattoo wedding bands. SloDive.com: This site features images of 25 more styles of inked-on wedding rings. WeddingBee.com: Newlyweds who participate in this site's message board discussions have uploaded numerous images of their own tattoo rings. Tattoos aren't the only form of body modification that you can consider as a unique approach to wedding jewelry. Some couples opt for midrodermal implant piercings when looking for a unique symbol of their commitment and lasting love. While this kind of piercing can be placed on the finger, this isn't the best location for one. Finger piercings get snagged and bumped frequently, often causing pain and damage. See Piercing Bible for a story about a reader's unpleasant experience with a finger piercing. However, finger placement isn't the only option. Consider getting nose, belly button or body piercings placed in other locations as your own unique wedding jewelry option. Photobucket ring piercing images: Visit this site to see images of pierced fingers. Before opting for such a piercing, carefully consider the potential problems and seek advice from a reputable piercing artist. Microdermal jewelry: Couples can select microdermal wedding jewelry in theee shape of their choice to create piercings in any locations where microdermal anchors can be placed. Well-known jewelry stores that specialize in bridal pieces may not be the best place to look when shopping for unique options. That's because such retailers tend to cater to traditional requirements and therefore might not have a large range of unusual designs. Independent and artisan jewelers, however, often have a wider range of unique designs than corporate stores that tend to stock similar items in all locations. Independent Jewelers Organization (IJO): IJO is a national membership organization for independent jewelers. Enter your zip code to search the directory for a member organization in your local area. Jewelers of America (JOA): This jewelry industry association represents all types of jewelers. Some of its members are independent, while others are part of corporate structures. The "Find a Jeweler" search feature can help you identify local independent stores. Regional jewelry associations: There are a number of region and state-specific associations for professional jewelers that you can use to help identify independent sources in your local area. No matter what design you choose, one way to make sure that your wedding rings are truly unique is to add engraving. A few important words or initials are a great way to customize or personalize a ring. 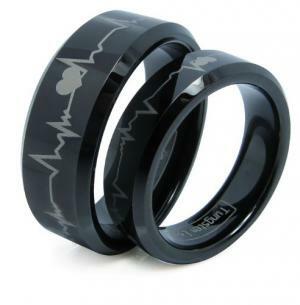 Unusual fonts or engraving styles can look stunning on a wedding band. Most stores that sell wedding rings offer engraving services for an additional fee. If you are planning to add engraving, verify that it's possible to do so to the styles you are considering before making a final choice.